Relaxed with a hint of glamour, this stationary sofa lets you turn your living room into a luxurious space. The plush pillow back promises comfort, while the clean lines and bench style seat cushion add contemporary appeal. The 1397 Slipcover Sofa with Bench Style Seat at Reeds Furniture in the Los Angeles, Thousand Oaks, Simi Valley, Agoura Hills, Woodland Hills, California area. Product availability may vary. Contact us for the most current availability on this product. Bring a sense of luxury to your living room with this slipcover seating collection. 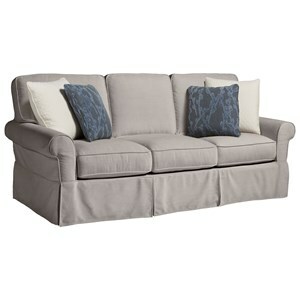 Clean lines and flared arms add contemporary appeal, while loose pillow backs and cushions deliver plush comfort. The 1397 collection is a great option if you are looking for Casual furniture in the Los Angeles, Thousand Oaks, Simi Valley, Agoura Hills, Woodland Hills, California area. Browse other items in the 1397 collection from Reeds Furniture in the Los Angeles, Thousand Oaks, Simi Valley, Agoura Hills, Woodland Hills, California area.